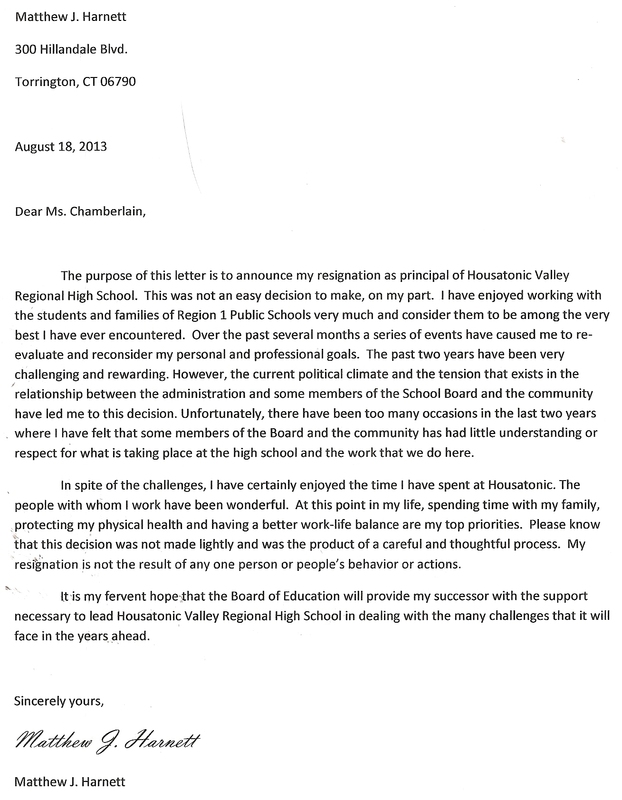 I think the delay was due to Patricia Chamberline and company having to help write the resignation letter. It reeks of her poor writing (bad grammar and all). There should be major blowback on the way this situation was handled. Apparently Jonathan Moore didn’t have any problem keeping in contact with the superintendent while he was on vacation, so the question must be why he didn’t have the courtesy to contact the Board immediately about Harnett’s resignation. In other words, as soon as he found out. For him to wait for a written resignation when Harnett’s resignation had been given verbally and it was confirmed that he was employed in Bristol is no more than game-playing and an attempt for him and the superintendent to keep things under raps and I might add under their control. There was more than enough time for a Board of Education special or even emergency meeting to be called last week to discuss the path forward, no matter what that way and who, Ian Strever or someone else, would be designated to lead . It wasn’t necessary for Moore to be there in person. I’m sure he could have joined the conversation by phone or by SKYPE or some other acceptable electronic way. Just another example of the back room dealings and lack of transparency that has so marked this central office administration. And speaking of Harnett’s resignation, what professional submits the written resignation this many days after the announcement, does it by e-mail and without a proper signature? Further, I don’t think I’ve ever seen a resignation quite like it! Best, I think, that he made the call he did. As far as I know the superintendent makes a RECOMMENDATION to the Board of Education regarding a replacement, interim or not. Although the selection of an interim or permanent individual must come as recommendation from the superintendent, the Board has the final say on this. For the Board Chair, who has no more authority than any other member of the Board of Education and the superintendent to usurp the authority of the Board of Education is just one more example of the horrid way this district is administered. And for Moore to dictate how the process of selecting a new principal will shake out is the ultimate insult. How that will happen is the Board’s decision alone, all of the members, not his or the superintendent’s or a combination thereof.